During Rogers' time at Michigan, he switched back and forth between offense and defense, learned a lot of different playbooks and schemes, and got to know quite a few coaches. Now, after earning his Michigan degree, James is playing for the KC Command, talking about his ambitions, and reflecting on many of the questions offered by TTB readers. Recent happenings: "I was substitute teaching back in my home town of Madison Heights, and I also coached football. I was actually going to take the middle school basketball coaching job and track coaching job, too, but I ended up coming down here to play arena football for Kansas City, so I'm going to do that for right now. But I'll probably look into coaching in the future. . . . [Arena football] is a little bit different than the outside game. It's a lot faster pace, a lot shorter field, and it kind of has a disadvantage for the cornerbacks because the wide receivers get to run up to the line of scrimmage, and go in motion. But I'm enjoying it so far, though. All my teammates are pretty cool; I'm having a good time down here." Favorite Michigan Memory: "I had two picks that Purdue game my senior year; that felt good on an individual level. . . . In 2007, my freshman year, we started off slow but ended up picking our season up and went down there to the Capital One bowl and beat Tim Tebow in the bowl game that year. So that was a great memory about the whole of Michigan football. I think that's one thing I'll never forget." Switching between offense and defense at Michigan: "It kind of helped me out; it was kind of difficult, too, though. . . I had to learn several play books. And when I was there, we went through two coaching changes and then went through another coaching change at defensive coordinator. There were a lot of different playbooks that I had to learn. I began to study every night; football was like a class in itself. . . . When Rich Rod got there, he asked me to come to the offensive side of the ball, and then at the end of my junior year, Coach Robinson came to me and asked me if I'd mind coming back over and playing [on defense], and I was like, 'yeah, sure, no problem.' . . . I just said to myself that I have to put all those young kids on my back and help lead that whole defensive backfield." Watching the 2011 Wolverines: "It was definitely tough to sit through those years where Michigan was at its down point because Michigan's one of those schools that's always on top. But what I can say about us and those seniors the two years before me is just that we were never going to give up. We stuck in there and we fought. We knew the main point was, yeah, we're there to play football, but let's make sure we get this education while we're at it. For some of those players like me who stuck around and went through those bad seasons, it was still good enough for us to know that we finished college and got our degrees from one of the most prestigious colleges in the world. But yeah, it would have been great to have been on that Sugar Bowl team. But I'm still happy for those guys; those are our boys, and I feel like we helped prepare them to do that." Differences between the two coaching staffs: "I'm not going to lie; it was definitely different from Coach Carr to Coach Rod's staff. We had just got real close to Coach Carr's staff, so it's kind of like when you lose someone really important in your life. . . . We were so comfortable with Coach Carr. It was almost like losing a parent or something. That's how we felt when Coach Carr had left. . . . Coach Carr and the whole staff, I really enjoyed his whole staff." NCAA investigation, Free Press allegations: "The part that hurt the most was it being brought to the media. It kind of made us seem like we were criminals, almost. The University of Michigan is a very big deal, so with people just looking at us like that, it kind of did give us kind of a negative view on the team. We kind of felt like, yeah we're working extra hard, but we didn't feel like we were doing anything too out of the ordinary that a lot of other schools weren't doing. It's something I think that also made us have that little setback, but as a team I think we stuck together, and I think we overcame it." John U. Bacon's Three and Out: "I have not read the book. . .I couldn't tell you anything about it." WR or CB? "I think any football player would love to be on the offensive side of the ball. How many young kids at a young age are like, "I want to be a D-lineman or a cornerback?' Everyone wants to be wide receiver, quarterback, or running back . 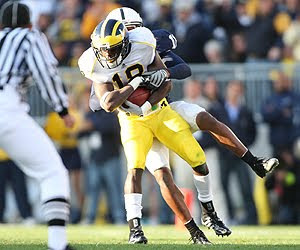 . . but at Michigan and knowing about Charles Woodson, I was happy to play cornerback, too, though. I'm happy I played cornerback, and if I had to do it again, I'd certainly play cornerback." James put up with so much during his M football career, happy to see he's doing well. Mailbag: Should Devin Gardner play wide receiver? Good luck to the men's basketball team! The Fifth Down: On Draft "Experts"